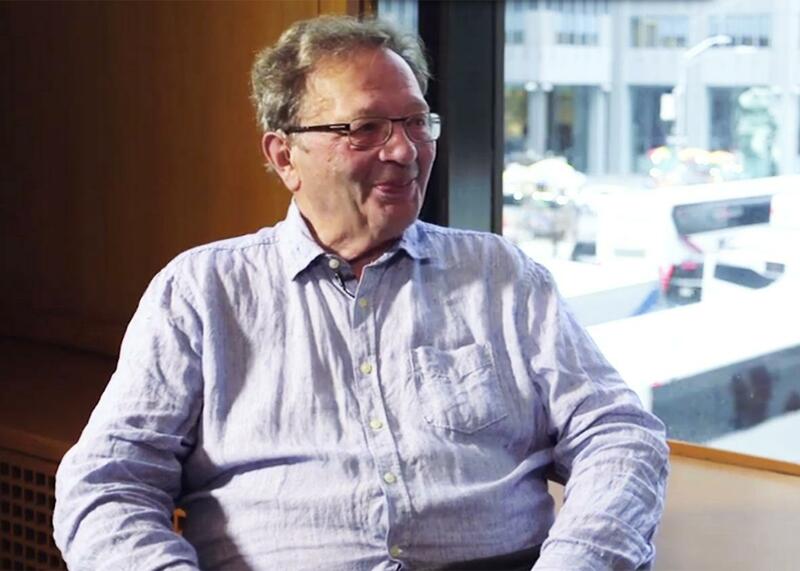 Bernie Sanders’ brother Larry Sanders discusses his brother’s childhood. Bernie’s big brother talks about their childhood and the Vermont senator’s failed bid to be high school president. Larry Sanders, Bernie’s older brother. After graduating from James Madison High School in Brooklyn and Brooklyn College, Sanders went to Harvard Law School but left after his second year to be with his ailing mother. (He returned and completed his degree in 1994.) In the course of traveling in the early 60s, he met his British wife, and when she became pregnant in 1968, they moved to Britain, where he has remained. A social worker and academic, Larry was inspired by Bernie’s election as mayor of Burlington in 1981 and became active in local politics while raising his two children after his wife’s untimely death, eventually serving as a Green Party representative on the Oxfordshire County Council. In 2015 he ran an unsuccessful campaign as the Green candidate for the Oxford West and Abingdon Parliamentary seat. This interview has been edited and condensed for clarity. Stein: You were born in 1935 and grew up during the FDR era. Were politics discussed much at home? Sanders: Our parents were not particularly political. They didn’t belong to any party, but they were idealists. There were just as many idealists in the neighborhood as there were Dodgers fans. We grew up thinking government can do good things. To somebody like my father—growing up impoverished in Poland and then coming to the States without a penny, no language, no education, no security ever—knowing that at a certain point there would be income from Social Security, it was like magic. My father was very keen on things like the gains made by labor unions even though as a [traveling paint] salesman he himself was not really helped by them. We didn’t feel that we were outsiders. People say, “Oh you grew up in an immigrant household.” Well, we did by one definition, but it didn’t feel like that. We felt very American. I wondered whether the Dodgers leaving Brooklyn was at the root of your suspicion of the status quo. Certainly for me it was important in becoming a socialist, when one guy for his private profit could do so much harm and cause so much unhappiness for so many people. I thought, “That can’t be right.” I’ve never asked Bernard if the sale affected him. Bernie seems quite forceful and certain of his views. Was he always like that? He was much less like that as a child. If anything he was on the quiet side. He did think he knew the answer to things­—in class he was frequently the kid with his hand in the air. But he was a regular guy. I think a lot of left-wing people feel somehow alienated personally and Bernard doesn’t. Being an athlete at that time [Bernie Sanders was captain of the school track team] conferred status on our block, more than money and so on. So he had that acceptance and normalcy from a very early age. And was a politician from an early age. He was class president. The truth is, it was not highly coveted. But school president was a big thing. He came third out of three. The other two candidates were very polished, smiling guys. They were talking about prom or I don’t know what—nothing very interesting. But Bernard had a serious platform. In the aftermath of the Korean War, there were hundreds of thousands of Korean orphans. And we read some place that school was not free. So there were kids who didn’t have parents, didn’t go to school, and had almost no future. Bernard came up with the idea that we could raise money for scholarships. The actual person who won the campaign adopted it, and they did raise money for a very good cause. Given that a portion of the electorate hears “democratic socialist” and sees the hammer and sickle being raised over the White House, do you think this label is something of a millstone around Bernie’s neck? Should he rebrand himself as a something else, perhaps a New Deal Democrat? I think calling himself a socialist had a very powerful impact at the beginning of his political career because it said to people “I think where we’re going is not right and I’m not afraid to say it.” Where he’s a democratic socialist is that he’s firmly convinced that the center of politics is redressing economic injustice, and that is not a New Deal idea. His particular policies are very New Deal. He’s not in favor of large-scale public ownership. The sense of economic insecurity in our family that I was talking about earlier is very deep, very real. What is unusual in Bernard is not that he comes from that background—tens of millions of people do—but that he hasn’t forgotten it for a minute despite where he is now. He knows that economic insecurity is a psychological issue. It isn’t just a lack of material things. Were you surprised when Bernie decided to run for president? He was mulling it over for at least a year, whether to go in or not, whether he should run as an independent or a Democrat, all that stuff. He didn’t have to do this. He had a job he loved, and he could get re-elected forever. If somebody else—Elizabeth Warren perhaps, or somebody else with similar politics—had gone in, Bernard would not have run. The two big things were first whether somebody else would come in, and secondly whether he could do well enough. Because while he felt he could live with being humiliated if he was beaten badly—it had happened before, it could happen again, and he’d still be a senator—if somebody with his ideas was beaten badly, that would allow all the others to say, “See, somebody with those ideas can’t win,” and all the people who needed those ideas would lose out. That is what he didn’t want to happen. But so far the campaign has shown that these ideas are not seen as extreme by large numbers of people, so anybody who wants to say that these ideas can’t fly is wrong. So are you prepared to be first brother? I’m working up to it.